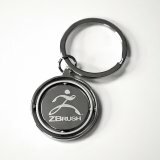 This handsome keychain sports a thick pewter ring 1 ¼" across, surrounding an enameled spinner that features the ZBrush logo. Very appropriate for the software that has put a new spin on digital sculpting! 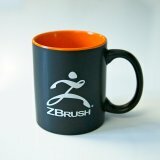 Show off your ZBrush pride with this new ceramic mug. Wtih a matte black outer glaze with an orange glossy accented inner glaze, this mug will be hard to miss! Sport your love for team ZBrush with this New Era 9FIFTY snapback baseball cap. 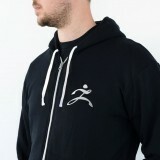 Black with a white Z Man logo on the front and “ZBrush” on the back. Black TShirt with logo on front and back. Whether it’s sitting on your desk or with you at the gym, this S'well® water bottle will show your love for ZBrush to the world. The ZBrush logo is displayed in white on the black bottle, opposite a distinctive silver cap. Show off your ZBrush enthusiasm with a Z-Shirt! Get this official Z-Shirt exclusively from Pixologic. Note: A manufacturing error has resulted in this product receiving labels showing the wrong size. We will ship the correct size to you based on the measurements above rather than the size printed on the label. Show your allegiance by wearing one of these sporty denim caps! 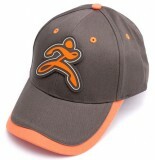 Available in six colors, each features a prominent "Z Man" logo on the front and a matching two-toned brim. The Velcro size adjustment strap at the back of the cap is embellished with "ZBrush" in quality embroidery.